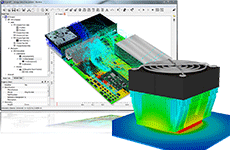 6SigmaET is a thermal simulation software for electronic applications. This thermal simulation is designed for concept studies, to optimize during the design phase and to verify designs before released to manufacturing. The tool is made to simulate complex geometries very fast with high accuracy. Extremely fast and robust parallelised solver; capable of solving models in excess of 300 million grid cells. Parallel solver can scale to over 128 cores using a High Performance Computer (HPC) Cluster. The version tree in 6SigmaET is a revolutionary feature, that consolidates all the various designs in a singular version tree, allowing for a tighter integration into product design cycle. Equipment which is cooled by liquid cooling can be easily modelled in 6SigmaET. There are intelligent objects for Cold plate, pumps, cooling duct and vents, which enables easy creation of a multi fluid system. Solar radiation can easily be included in the thermal simulation. A wizard sets up the thermal simulation with the correct solar specification for the location and date that needs to be simulated. Electrical boundaries can be added to objects in your model including PCB traces and solid obstructions. The model can then be solved for electrical potential and current. The joule heating can then be calculated. 6SgimaET can import ECAD data through the IDF, IDX and XFL file formats. PCB outlines, Components, layer and trace information can all be imported. The import PCB and components are created as intelligent object enabling their specification to be configured parametrically. Export 'ready to use' models for data center performance simulations. Automatically create simplified models of the equipment for use by customers housing your equipment in racks / cabinets or mission critical facilities. Fully integrated with 6SigmaRack and 6SigmaRoom. PAC Manager enables creation of multiple version of the same model with a range of different parameters. The PAC in PAC Manager stands for Parameterise, Analyse, Compare. It is a tool which allows us to set up a number of alternative cases based on a range of Input variations. Output parameters are used to quickly compare like values between the models. A comprehensive set of post-processing displays ensures easy analysis of the results of the CFD simulation. In addition, fully customizable reporting makes it easy to communicate the results, especially when comparing multiple alternates. Don't spend time on grid generation: 6SigmaET can do it all for you. Our object based gridding uses pre-defined rules to automatically decide the best grid for the simulation. Just click solve and the grid is automatically generated. 6SigmaET greatly expands modelling automation. Objects come with rules that auto: place, align, collision-detect and error-check. Plus grid-generation rules automatically ensure the optimum grid is always used. Simulation results are object-associated as well. Display of critical temperatures and airflow patterns can be initiated from the objects directly. Highly customisable automatic report-generation ensures the results of the study can be easily and effectively communicated. Automated revision-control and design-timeline tracking are included to enable designers to organise design variations and track design progress from concept to production.